The brand new MFT March Release is now available for purchase at MFT Store!! Yay!! 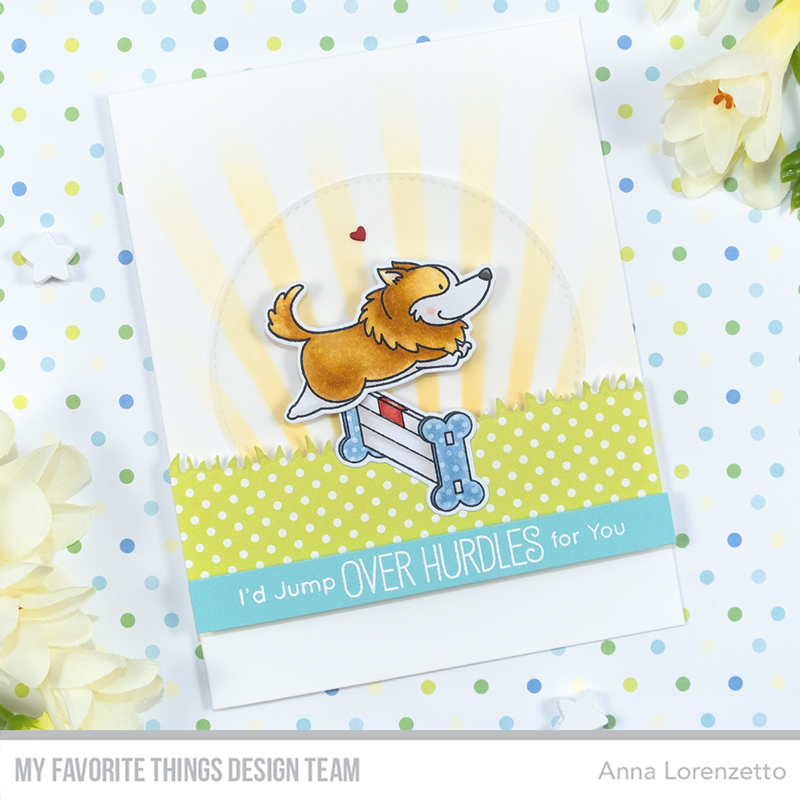 I have a fun card to share with you today, featuring the amazing BB Best in Show stamp set. To start, I stamped and colored the images with my Copic Markers, adding some details for an eye-catching look. I ink blended some Wild Honey Distress Ink over the Ray of Light Stencil directly on a card base and layered a vellum circle and a scrap of green patterned paper on it – previously die-cut using one of the grassy edges from the Grassy Hills Die-namics. I heat embossed the sentiment in white on a strip of Summer Splash Prestige Card Stock and added it to my scene along with the other elements. Be sure to check out the MFT Blog for a closer look at the new products released this month and see what the other DT members and guest designers have created! How cute is this dog! Love your background and coloring Anna. Thanks for the inspiration! Such a cute and happy card! Thanks for the inspiration! Is this a Corgi , cause I love me some Corgi’s 😂 ! Oh what an adorable card! Such a sweet scene and sentiment. Lovely layout and design. Cute card! I love this stamp set and love the way you used it. I like your paper piecing. This is such a happy card. Love this cute puppy jumping over the hurdle! This reminds me of my dog. He was so happy to jump over the hurdle in class. Greta job designing this card. This is adorable! I love the way you used the Ray of Light Stencil and the heart is such a sweet touch!!! Such a happy card with Corgi. Love it. Super cute doggie and so talented! Super cute, love your adorable scene! I love this card example – from the background to the cute dog! Cute card. I like your idea So! What a GREAT scene! I love this leaping pup! Is that one of the Queen’s corgis? Love your use of patterned paper. Such a cute card. Great inspiration. The way you put the sunrise in the background is brilliant! It gives such life and focus to the card, thanks for the inspiration! Such a cute scene you created with these adorable show dogs. The dog looks like he really is enjoying the jump. Love the white polka dot embellishments on the grass. Great coloring. OMG!! This is so cute!! I actually love to watch the dog show contests!! Such a cute card! I love the rays in the background! Super-cute and love the background! Cute scene with this dog. I’m a cat person too. Cute card! My sister-in-law has a couple of Corgis and would love to have this card. I like how you paper pieced the ends of the fence! Love my corgi, which gives me even greater appreciation for your fun card! This was the first set from this release that I added to my cart. Your card is awesome!! Cute pup leap hurdles…Best in Show. Well done! Super cute, superbly done Anna! I’m a dog person… and this BB Best in Show card is adorable. Love the use of the vellum circle and the Ray of Light stencil! Adorable card! Love the ray of light stenciled background! I love these dog show stamps, your card is adorable! What a fun card! 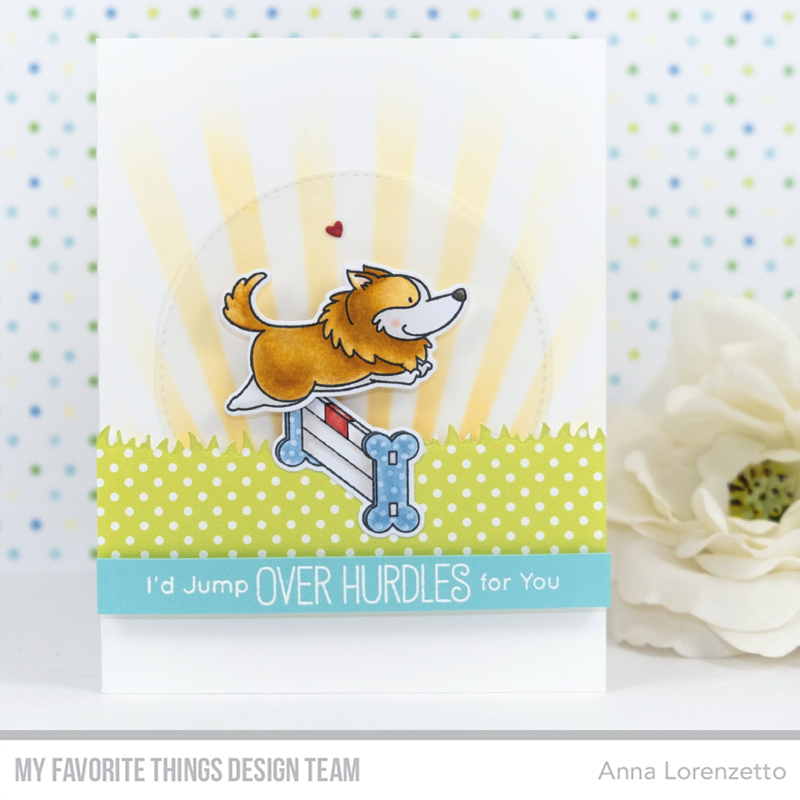 I love the sentiment with the fun little hurdle and the light rays in the background are a terrific addition! This card just makes me happy!! Now I am going to have to get this stamp set. Too cute. I love this set and can’t wait to get it. Your card is so adorable! Love this adorable puppy & the sentiment is perfect! Adorable dog and love the polka dot grass. Adorable card! Love this sweet pup! Love the card designing the grass and the rays of sunshine and the adorable puppy. I love love this stamp set. I can’t wait to receive it. Your card is beautiful! !